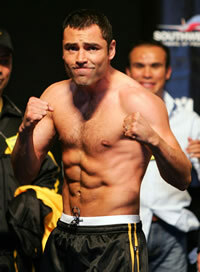 of boxing’s most decorated stars, Olympic gold medalist and former 10-time world champion, in six weight divisions, Oscar de la Hoya. De La Hoya, President of Golden Boy Promotions, will be joined on the week-long USO tour by Golden Boy Promotions fighters-undefeated lightweight Adrien Broner (Cincinnati, OH), heralded middleweight Danny Jacobs (Brooklyn, NY) and undefeated heavyweight Seth Mitchell (Brandywine, MD). On a mission to boost troop morale, the group will participate in boxing clinics, share techniques and extend their thanks to America’s troops serving in the Middle East. This year the USO celebrates 70 years of service to troops and their families. Entertainment tours are one of the many ways the USO lifts the spirits of our nation’s heroes and their families. Celebrity volunteers such as De La Hoya make it possible for the USO to boost the morale of hundreds of thousands of troops around the world.